The red light came on at the Coyote Point Shooting Range in San Mateo, Calif. signaling the shooting area was now “hot.” Andy Navarro stepped over the red line, placed his AR-15-style semi-automatic rifle on the table next to a tiny pillow and perch; sat on a small stool and began thumbing 5.56 mm bullets into the rifle’s five-round magazine clip. 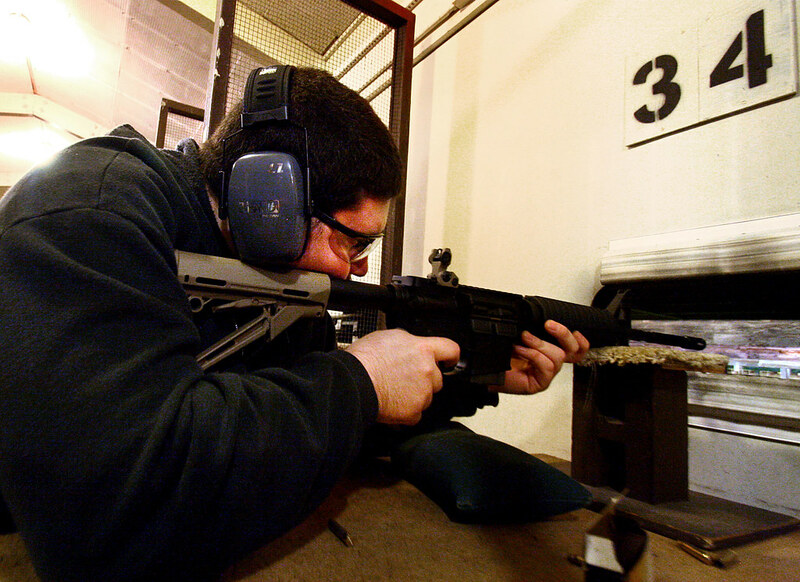 That night at the range, Navarro shot his AR-15-style rifle for the first time, a gun he built himself. Navarro’s semi-automatic rifle is very similar to the infamous AR-15 Bushmaster police say Adam Lanza used in the massacre at Sandy Hook Elementary School. The tragedy reignited the national gun debate, an issue that has divided Americans. On one side, people are calling for greater gun control laws that ban military style weapons and for more background checks, while others fear more gun restrictions could infringe upon their Second Amendment rights. Fearing a ban on AR-15 style guns, 23-year-old San Jose resident Navarro went to a local gun store to buy the semi-automatic rifle before it was too late. It was a week after the Sandy Hook shooting, and people were flocking to gun stores to get the rifle. He paid $300 for just the lower receiver, the part that houses the actual firing mechanisms and the only part requiring a background check. He bought the rest of the gun off the Internet, spending a little more than $1,000. He assembled the gun in an hour after learning how from a YouTube video. Navarro said it would’ve taken less time, but he spent 30 minutes looking for a tiny piece of the gun he misplaced. What makes Navarro’s gun legal in California is a bullet button, which makes the magazine removable only with a pointed tool. California’s Democrat-controlled state Legislature looks to be leveraging the growing opposition to guns with handfuls of propositions they say will make the state the strictest in the country. The proposals include banning all semi-automatic weapons with detachable magazines, background checks on ammo purchases, prohibiting more guns and requiring all firearms to be registered. Some proposals intend for the prohibitions to apply to current gun owners. “I wouldn’t give my gun up,” Navarro said, adding that he would rather move to a state with less gun restrictions. Gerald Eisman, director of SF State’s Institute for Civic and Community Engagement, said there are three categories, which are often overlapping, of gun owners. The first one includes hunters, sport shooters and collectors. Then there are those who own guns for self-protection. The last category are those who believe the Second Amendment was written to protect the citizens from a tyrannical government and that they should be able to possess military style weapons. The Institute for Civic and Community Engagement is a neutral organization that promotes civil discourse and it will be hosting the SF State Forum on Reducing Gun Violence, March 4. The second category, those who own guns for self-protection, is where the real debate is centered, according to Eisman. Community activist, Espanola Jackson, 80, who has lived in the Bayview since 1948, is not shy about letting everyone know she is packing heat. She supports no locked guns and more lethal bullets for San Francisco and has filed a lawsuit with the city challenging the constitutionality of the city’s gun law. City law forbids her from keeping the gun under her pillow, the very place she wants to have it, and instead requires gun owners to keep guns locked safely in a box. The lawsuit was recently dismissed, but lawyers for the NRA are currently seeking an appeal. Similar restrictive gun laws have been struck down by the U.S. Supreme Court as unconstitutional. In the 2008 landmark ruling of District of Columbia v. Heller, the Supreme Court interpreted the second amendment as an individual’s right to possess firearms, including for self-defense in the home. The ruling effectively struck down the District’s gun laws banning handguns and certain other laws restricting guns in the home. Not to worry, Jackson said she doesn’t want to kill anybody. She said she owns a handgun with a laser sight, that way she can aim for the knees and not miss. Jackson only wants to handicap intruders, so they can’t break into anyone else’s home. Not everyone is a gun lover. In fact, many believe it to be the number one risk factor for violence. Joseph Marshall, executive director of Omega Boys Club and member of the police commission, said he finds no value in a gun. At the Omega Boys Club, Marshall works with troubled youth from around the Bay Area, ranging from 13 to 24-years-old. His job is to reduce the harm caused from what he calls the “disease of violence.” Sometimes, his classes have as many as 60 kids in them, and the last thing Marshall wants to encounter is a kid with a gun. For the 45 firearms-related deaths that occurred in San Francisco in 2010, 14 of the victims were between the ages of 15 to 24, according to the California Department of Public Health. Nine of those kids killed were black, four were Latino and one was white. Thomas Taper, the program director for the Community Response Network, said he knows of about 200 people who’ve died from gun-inflicted wounds in the past six years. The response network is a violence prevention group, which responds directly to shootings of young adults in the southeastern section of San Francisco. “There’s too many guns available on the streets for youngsters,” said Taper, who’s not completely against guns, just guns in the wrong hands. Taper owns a .40-caliber pistol he got after his house was broken into. Most guns that make their way to the streets, according to Taper, were originally purchased at gun show, where lax laws make guns easier to get. He’d like to see tougher gun laws that cracked down on gun shows. He supports more background checks on guns and limiting the amount of ammo a magazine can hold. Taper, 50, has been working directly with the community since he was 18. For Alfaro, guns have come to symbolize a lot of power to the youth. Guns can be seen as a tool with dual purposes. Guns kill and protect. “I see a lot of kids who believe guns are going to protect them and what you end up with are a lot of dead kids,” said Marshall, who organized a gun buyback on Dec. 14 at the Omega Boys Club, on Tennessee Street in the Dogpatch. The program collected about 300 guns from people, no questions asked. If he can’t ban guns, Marshall will stick to changing the minds of the youth most likely to be affected by gun violence. Plus, he added, you can’t pass legislation before you change the people’s attitudes. A 40mm hand gun is a very large gun. Don’t you think? Maybe one should learn a little more about the subject one is writing about before trying to swing peoples opinions on the issue. Banning weapons is a mistake. Making sure the people who shouldn’t have guns don’t is a worthy goal to achieve.